In what is destined to become the go-to trick for professionals around the globe, "BARE" generates screams, gasps, and reactions like no other trick we know. This special, hand-altered sharpie marker allows you to cause ANY card, initials, number, or simple shape to appear ON A SPECTATOR'S HAND. They hold out a hand palm down and you gently sprinkle salt, pepper, coffee grinds, or sand on their hand. By rubbing their hand gently, their thought-of shape APPEARS on their own hand. The "BARE" sharpie allows you to invisibly write or draw anything on YOUR hand, which you easily and imperceptibly transfer onto their hand. The best part? It has no scent or stickiness, and can be easily wiped away after performance. This a the hygienic, "neat" version of the "Ashes on Arm" trick that doesn't endanger a spectator's clothing or look "dirty." Includes full video performance and explanation download link. 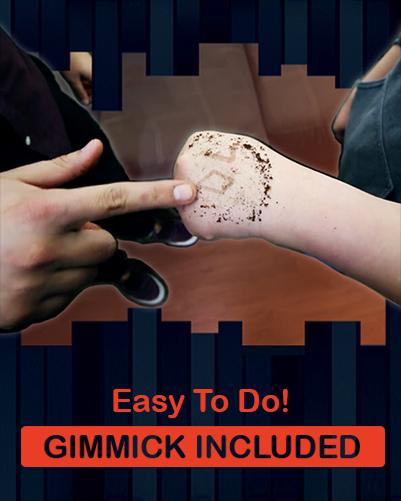 If you have seen the video, you will have watched how easily and invisibly you are able to 'stamp' your spectator but here is something that really excited us... the 'special stuff' will stay on their hand, undetected, for up to TWO HOURS. So, imagine this. You introduce yourself to a group and secretly 'stamp' one or multiple people as you shake their hands. You can then choose to perform "BARE" immediately, or the beginning, middle or end of your routine (or even later on!). In your package, you will receive the very specially modified "BARE" Sharpie, plus the link to a 35-minute instructional download (this will also go into your account immediately after you purchase!). Note: We would like to thank an excellent magician and friend of Vanishing Inc., Spidey, who published a wonderful version of this effect. He gets full credit for the idea of transferring onto a spectator's arm and using pepper to reveal the impression. "BARE" exists with his full blessing. This thing is insanely good. I preordered it and the wait was very suspenseful and omg it was worth the money and wait. The OB really have outdone themselves with this. Super easy, visual, streamlined and a WORKER. A working magicians dream for this plot in magic. Amazing! I don't often write reviews, but I took this out of the box and used it immediately and got a huge reaction! I love this trick! I knew what I was buying and when I got it I was very impressed but I definitely think that when you can use this is limited. I personally don't want to carry about pepper packets in my pocket but I can see this playing almost everywhere. It is practical because you can just carry this and be set and also, there is so much you can do with it. Before you buy, make sure that you will use this because we don't want these to go to waste! This is an AMAZING routine and very deceptive device. I've performed with it for about a week now and getting epic reactions. In my secondary career as a teacher, my students love it when I do routines. Pepper, Salt, Coffee, and we can add Pencil shavings to that list. Great trick, awesome method. I really love this trick but I just haven't found many situations in which I would perform this over a simpler trick. Love the creative thinking though! This is way too good. This plays out almost everywhere, and is also very practical. Also it is extremely easy to use. Enough talking, just buy the thing!